I am a huge fan of lip oils and I am so happy to see one of my favourite budget brands release their own! Barry M have launched so many new products recently and these two lip oils were part of that incredible line up. I have been obsessed with these and now favour them over my high end lip oils - yay for saving money! Lip Oils are incredibly hydrating on the lips and these are no different. Barry M have released two lip oils, Coco Loco and Berry Good. These lip oils have a non sticky formula and leave a gorgeous gloss to the lips. Each of the lip oils has different ingredients to make the lips super soft! Coco Loco smells like delicious coconuts which reminds me of summer and has coconut oil and camellia to hydrate and nourish the lips. Berry Good is smells like raspberries (to me anyway) and has raspberry and pomegranate oils to be super moisturising and conditioning. 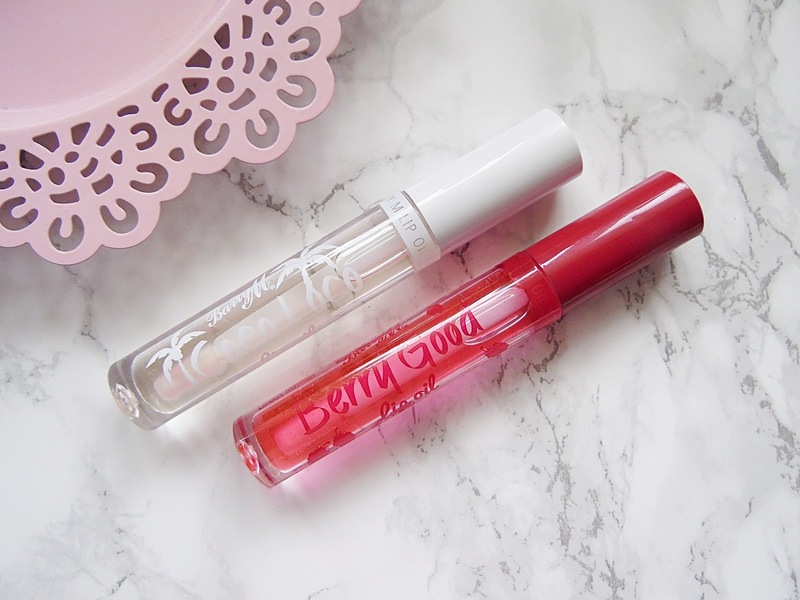 Coco Loco is clear and Berry Good gives the lips a very light hint of pink to the lips. These don't have a sticky texture which I love but they are slightly thicker than other lip oils which I actually prefer as it is longer lasting and still keeps my lips hydrated but the gloss stays around for longer. As these are slightly thicker on the lips they feel more like a thin lip gloss rather than an oil. I would say that they last for a few hours on the lips before they need reapplying. The applicator is a doe foot and it is easy to apply to the lips without going outside the lip line. I have been using this for the past couple of weeks and they are so hydrating and nourishing on the lips and actually deeply nourish the lips. I find with a few of the lip oils in my collection that they feel hydrating on the lips while they are on but once they fade my lips feel even drier but that isn't the case with these as they provide long lasting nourishing effects. These have quickly become one of my favourite lip products and I have been keeping Berry Good in my handbag and Coco Loco on my bedside table so I am never without these. I am so happy to see high street brands doing lip oils and you won't want to miss these - I am super impressed! I hope Barry M bring out more of these and I would love to see a vanilla one, please Barry M!! The Barry M Lip Oils retail for £4.99 each - HERE.